Shannon Reagan has always been a puppet maker. “I started making puppets when I was three,” she said. She would take scraps from her mother’s sewing room. Using stuffing, sticks, an old needle, and thread, she would make marionette birds by the nightlight. Eventually, her mom began giving her materials to make more puppets. They would go to the store and get fabric, and the cashiers started to get to know her and always asked about her projects. She made puppets out of everything, including the berry bushes outside her house. Shannon Reagan displays her puppets Zephyra (left), Seal (right), and Gink (top right). Photo credit: Haleigh Missildine. Reagan attended Cornish College of the Arts and dreamed of working for Muppets creator Jim Henson. Henson created puppets for many movies, including The Dark Crystal and Labyrinth, two movies that heavily influence Reagan. Unfortunately, Henson died before Reagan had a chance to work with him. “Puppets were dying,” Reagan said. Computer-generated imagery was taking over in the film industry. She couldn’t even get a free internship. “I just wanted into that world,” she said. 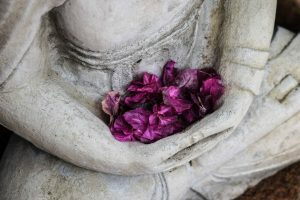 Her family moved from Northern California to Washington when she was young, and she lived in the Bothell area for many years. She got married, had kids, and lost two houses in the 2008 market crash. They moved from rentals to rentals for years and couldn’t find anywhere. “We wanted a new place, but no one would take us – not because of the 12 goats, but because of the seven kids,” she said. Shannon and her family started looking south, towards Olympia, and found acreage, large houses, and cheaper prices. Now, she has a large workshop where she spends her time creating puppets. 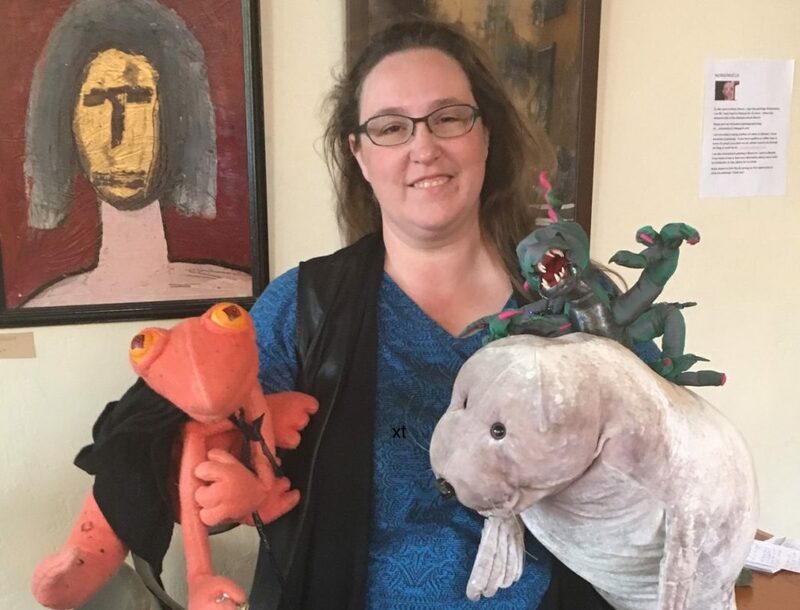 Shannon Reagan is pictured with her puppets at MythicWorlds Seattle in 2015. Photo courtesy: Shannon Reagan. 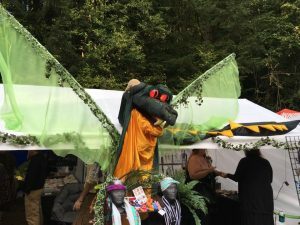 She’s the vice president of Puppeteers of Puget Sound, and she’s going to be teaching a class at South Puget Sound Community College, too. “My dream can now happen,” she said. Shannon is currently working on a puppet travelogue film. “There’s three characters. 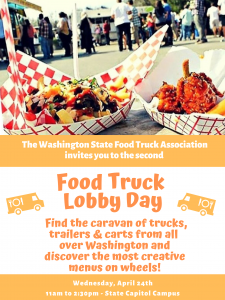 First there is a steampunk wanderer, who finds things around the state, like the Procession of the Species, the Freemont Troll, or the Olympia Farmers Market. Then there’s the professor, who doesn’t let anyone get a word in, and there’s the vlogger, who has her tablet and phone and interviews people,” she said. Shannon’s puppets come to life in many different ways. Sometimes you know what you’re going to get, and other times, they just happen. “Sometimes I’ll look at one, and the character will just come out,” she said. As we were talking, Reagan pulled out a puppet. “This is Zephyra, the vermillion amphibious assassin,” she said, as she pulled out a reddish-orange creature with salamander eyes and a jar of poison in his hand. “He worked for Caramel Corn which is advantageous because Caramel Corn is not tracked by the government,” she continued. She created Zephyra for a villains vs. superheroes contest. She used a name generator and wrote down all the ideas she liked. She got Zephyr, which she changed to Zephyra, and vermillion also kept coming up. From there, she created Zephyra, the vermillion amphibious assassin. 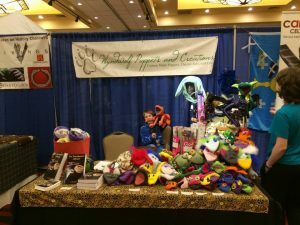 Shannon Reagan makes puppets big and small to show and sell at conventions. Photo courtesy: Shannon Reagan. “Salamanders are amphibious and a vermillion color, and vermillion is a mineral that is poisonous. So what else would a vermillion amphibian villain do other than assassinate?” she said. “Seal was a character that was specifically picked,” she said, as she pulled out a grey seal puppet. “He looks like the seal from Irish waters, because it was an Irish legend that I was doing a performance of,” she said. People who buy Shannon Reagan’s puppets feel that the puppet they buy is just made for them. For example, during her 20 puppets in 30 days challenge, she made a yellow puppet with a rainbow mohawk and sunglasses. Someone saw the puppet and immediately knew that he had to had it. He’d been looking for a puppet that he could photobomb people with as he travelled. He bought it right away. Conversely, some puppets just don’t sell as well. She tried to create Seahawks themed puppets, but since she’s not very into sports, “my heart and soul just wasn’t in it,” she said. Aside from making puppets, Reagan likes to do cross stitch, write books, and illustrate. Her family also became accidental pet breeders. She bought some mice to photograph and use as a basis for some illustrations, but they ended up with 100 mice. Now, they are official pet breeders for some pet stores. They’ve bred skinny pigs (bald guinea pigs) as well as mice, and are now looking for some healthy, quality rats. The family is mini farmers, with a garden, goats, ducks, chickens, rabbits, dogs, and toads. Overall, the puppet culture is growing. Portland and Seattle both have a strong presence. And since every puppeteer is unique, there’s no competition in the community. “You’re often running a puppet with three or four other people, so you can’t really be competitive. People want to help out,” she said. Reagan’s success keeps growing. “People from Hollywood want to be puppeteers for my travelogue film,” she said. 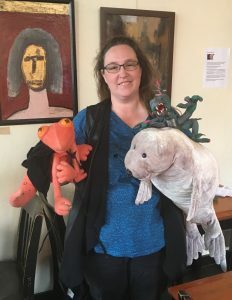 She hopes to have a day of puppets in March in Olympia, and hold more workshops and do more teaching. She also hopes to have a puppet finished for the Procession of the Species. 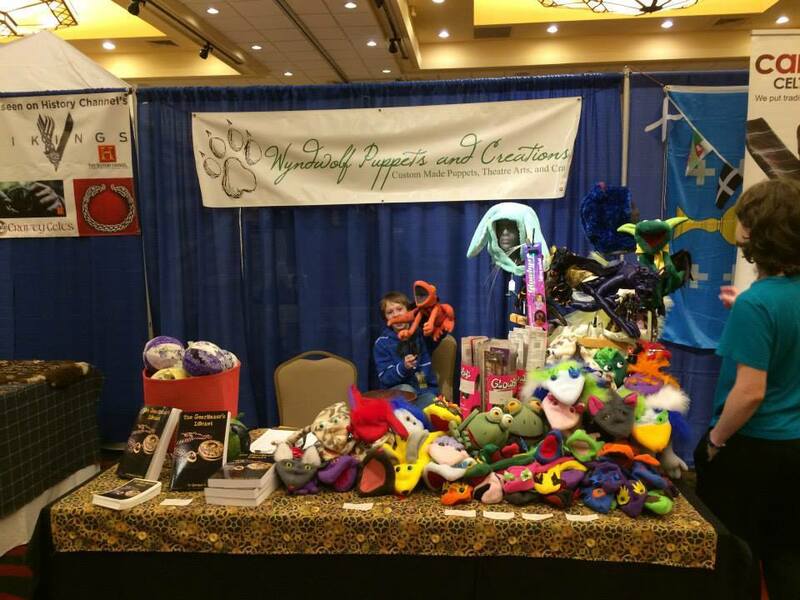 To learn more about Shannon Reagan’s puppets, visit her Wyndwolf Puppets website or follow her action on Facebook.